Welcome to part 10 of our Snapchat Influencer Q&A series, where you can learn from the masters as we deconstruct the techniques used by Snapchat influencers. Today we are talking to Kristy Gillentine. Kristy is a longtime journalist and digital storyteller, as well as a social media and public relations consultant and trainer, helping people and brands leverage compelling storytelling to champion their own causes and grow their own communities of engaged supporters. 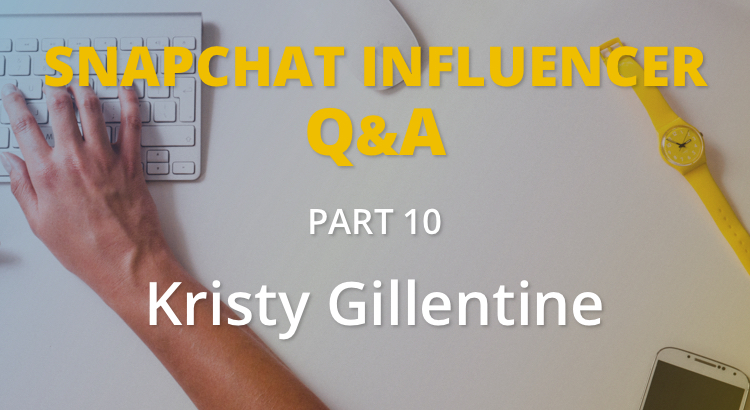 We talked to Kristy about how #ChatSnap, the potential of Snapchat and much more below. Hi Kristy, great to meet you. Thanks for taking the time to share your knowledge with us. Could you tell us a bit about yourself and what you do? Thank you so much for having me! I’m honored to be part of this. I am a longtime journalist now serving as Vice President of public engagement for a communications firm called Drive West Communications in Houston, Texas. I help clients, ranging from nonprofits and small businesses to large school districts, government agencies and Fortune 100 corporations, tell their stories using social media and media relations. Could you tell us about #ChatSnap and why you run it? #ChatSnap is the Twitter chat all about Snapchat that happens every Wednesday at 2pm ET on Twitter. We have a different topic each week and usually have a special guest of the week. I love Snapchat and I love Twitter chats, and I know the amazing ability Twitter chats have to bring people together around a shared interest. I looked for a Twitter chat about Snapchat, but there wasn’t one. My friend Madalyn Sklar is a Twitter chat master (she’s hosted a chat every week for the past five years and is the creator of the super popular #TwitterSmarter chat that happens Thursdays at 1pm ET). She encouraged me to start my own chat. With the support of a core group of friends, I launched #ChatSnap on March 16, 2016. We’ve trended at least nationally since Week 1, and we’ve been listed online as one of the top Twitter chats for social media marketers to follow. Current records are 336 profiles, 1900 tweets, 9.2M reach and 109.2M impressions. We also now have a Facebook group where the community can further connect outside the chat. I’m excited to see the chat continue to grow and the community continue to thrive in 2017. My content varies, but I always try to snap with purpose, and I prefer stories that have a beginning, middle and end. My favorite stories I’ve done and the ones that have been most successful have been audience engagement stories where I ask my Snapchat community for their ideas/input/suggestions, etc. and then tell my story by incorporating their input and citing them for it. For example, an “ask me anything” interview with my 100-year-old great-grandma where everyone sent her questions and she answered them on my story (see the video below). Or when I broke my foot and had people submit tall tales for how I broke it, since the real story was rather boring. Once, I asked my Snapchat community to tell me what they wanted to see from news organizations on Snapchat, which I then put into a story that was later shown during a training session with a newsroom. I’ve also enjoyed and received great feedback from stories in which I’ve volunteered with nonprofits and helped to tell their stories. Snapchat has opened a lot of doors for me and my personal brand, especially since I launched #ChatSnap. I’ve made amazing connections and had a lot of opportunities because of it, including podcast appearances, interviews, guest spots on other Twitter chats, features on blogs and speaking engagements. I’ve done Snapchat training sessions with newsrooms and nonprofits, and I’ve had the opportunity to do Snapchat stories on behalf of partners like convention and visitors bureaus and other organizations. It’s also helped me professionally because I’m always listening and learning and getting new perspectives from people and brands I engage with on Snapchat, and I often end up with ideas and strategies that I can take back to my clients. 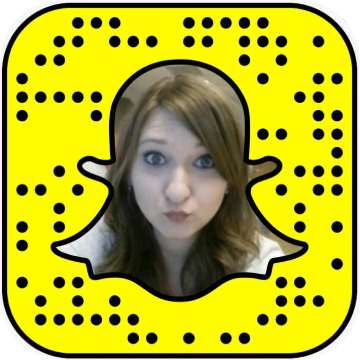 When did you realise the potential of Snapchat and when did you get serious about it? I first joined Snapchat around Halloween 2015. I’d known about it for a long time, but I never felt a need to get on it, simply because I was focusing my social media efforts elsewhere. Then, Brian Fanzo (iSocialFanz) started singing its praises, which prompted me to give it a try and see what the newest buzz was about. I was immediately hooked. I knew Snapchat was a big deal with younger audiences. But it wasn’t until I got on it myself – and, really, it wasn’t until I became active and saw how it fostered such deep connections – that I realized the power and potential it had and still has as a creative storytelling and marketing tool. Around the turn of the new year in 2016, I began taking Snapchat Stories seriously, and I haven’t looked back. What advice would you give to someone who is just starting to grow their Snapchat audience? Keep in mind that we are all trying to figure it all out. There are varying levels of comfort with the platform, sure, but no one knows everything there is to know, and It’s constantly evolving and changing. Also, one of the best ways to improve your presence and value on Snapchat is to watch others and engage with the content of other people. Take what you see and apply it to your own account. What works for someone else may not work for you, but never be afraid to try new things. And finally, be yourself. It’s such simple advice that can be so difficult to execute sometimes. But on Snapchat, perhaps more so than anywhere else on social media, it’s crucial to just be yourself and let your personality and passions shine through. One person?! It’s literally impossible to name one person, and when I think of “favorites,” probably close to 30 people enter my mind immediately. ChrisStrub, ChrisMcManamy, iSocialFanz, JoelComm, MarkKaye, Metz044, ShaunAyala, VictoriaTaylUK, Heidiapi6, KaitlinMoose, Baierman11, BizAaron, BlakeC432, CammySutra6, Purcelliraptor, ChocJohnny, JoeWilsonTV, KatieSMiller, LauriRottmayer, SayItForward, BreePalm, MadalynSklar. I think competition between these brands is how users will stay on the winning end. 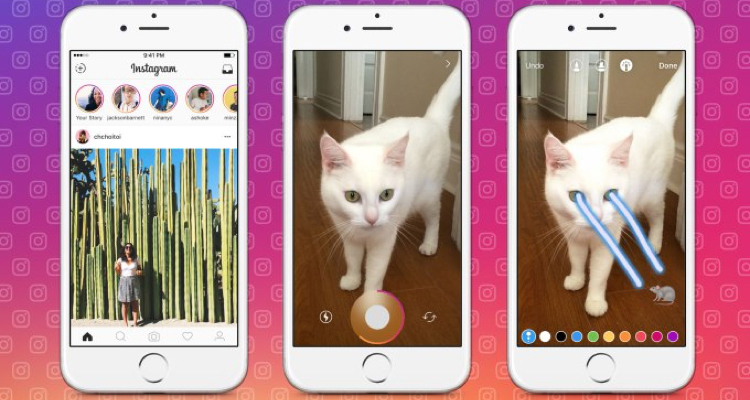 I hope Snap Inc. recognizes that they need to continuously innovate. They must keep thinking outside the box and developing updates and features and products that make Facebook want to copy them. And they need to do that while also keeping a watchful eye on how Facebook is doing the same. I’m @KrisGillentine across social media, and there are links to all my profiles on KrisGillentine.com, where you can also find more information on #ChatSnap, including snapcodes of all our past guests and recaps of past chats. I’m 100% here to help in any way I can. If anyone is confused by Snapchat or wants content ideas or recommendations of who to follow based on your industry and interests, please reach out. Also, if anyone has any topic or guest suggestions for future #ChatSnap discussions, please reach out. I’m always a snap away! And I invite you to check out #ChatSnap – The Twitter Chat All About Snapchat – every Wednesday on Twitter at 2pm ET. Thanks again! #1 One of the best ways to improve your presence and value on Snapchat is to watch others and engage with the content of other people. Take what you see and apply it to your own account. #2 What works for someone else may not work for you, but never be afraid to try new things. #3 #ChatSnap is the Twitter chat all about Snapchat. Check it on Wednesdays at 2pm ET on Twitter. Thank you Kristy for taking the time to share your knowledge and opinions. To connect with Kristy on Snapchat, scan the snapcode at the top of this article. If you enjoyed this interview, please check out more in the Snapchat Influencer series.